Emerging technologies are having a big impact on the future of healthcare worldwide. As the population increases, so does the number of health issues. Against an increasing backdrop of health care reform and controversies, more companies are looking to develop technologies that can deliver quick results, with more time for the patients suffering chronic illnesses. In 2018, we have seen a shift towards medical technology. The industry has steadily grown each year, expected to be worth a staggering 467 billion in 2020. A sharp rise in augmented reality and VR has also seen a change in the market, with companies realising the potential of the tech. Mobile phone use has only served to enhance the need for these options. With the healthcare profession also becoming overburdened by complex processes, the innovation and development in medical technology are essential for saving lives. Medtree, leading distributors of medical supplies and first aid kits, are discussing the tech trends in medicine, and what they spell for the future. Recently, it has been reported that drones delivering medical supplies are saving lives in countries with poor access to hospitals, lack of roads and medicine. Zipline pioneered the world’s first national drone delivery network, which has made almost 1,000 drops of blood in life-or-death conditions. Initially established in Rwanda, the company is looking to expand to Tanzania to serve a further 1,000 clinics, particularly in areas where roads are almost impossible to cross and far away from urban areas. One recent example was a drone taking just 10 minutes on a trip to save the life of a patient, rather than the healthcare worker cycling 10km in harsh conditions. Medical surgery is tipped as one of the more promising areas for augmented reality. Touch Surgery is one of the latest pioneers of the AR trend, developing Go Surgery - designed to provide medical professions with step by step guides to the particular surgery procedure, holographically projected onto a screen. The augmented reality tool will train medics on the detailed aspects of surgery, and the guides will show how the procedures must be performed. Doctors have also been using the Microsoft HoloLens AR glasses as part of reconstructive surgery, especially on patients with severe leg trauma. The Clinical Skills App, designed by Medtree, is a free programme that allows clinicians to record skills and clinical interventions. 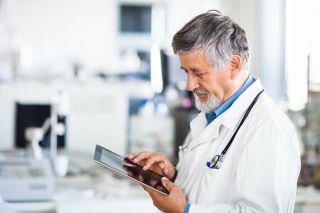 Extensive research behind the app demonstrated a lack of tech support for clinicians, leading to the creation of the app - the brainchild of a number of healthcare professionals. Instead of noting down clinical cases, this app provides the benefit of easily documenting airway interventions, wound management, drug administration and more. You can also activate new features as they are produced and personalise the app, enabling users to utilise opportunities for their development in the medical industry. According to the most recent skin cancer statistics, there are an estimated 15,4000 melanoma cases each year, or 42 per day. However, Australia and New Zealand residents are most at risk of the fatal illness. Therefore, the QIMR Berghofer Medical Research Institute has conducted the world’s largest skin cancer study to create a highly accurate online test. The team behind the test, only recently made available in March 2018, followed 45,000 people living with skin cancer over eight years, developing the test for those between the ages of 40-70. The test predicts your likelihood of developing the disease in the next three and a half years, in the hope of preventing fatalities. It’s the latest innovation in the skin cancer industry, following on from the success of MelaFind in 2011. The non-invasive device uses the light from visible to near-infrared wavelengths to evaluate skin lesions and other concerns, up to 2.55m below the skin. MelaFind even proved to be more specific than clinicians, demonstrating 10.8 specificity to 5.6% respectively. However, this is not the only technological advance in the industry. 3D printing is used today for various medical reasons, and the industry is experiencing tremendous growth. Between 2017 and 2025, the market is set to expand by a massive 17.5%, with key drivers of the industry including healthcare. 3D printing can be used for instrumentation and implants (hip joints etc.) and external prostheses. However, tissue engineering is currently under development and the newest practice for 3D printing. Several startups are, currently, looking for funding within the sector, including NIN Ventures. To spearhead their medical developments, they have added Dr Sunil Patel, a multi-organ transplant surgeon. Likewise, Organovo is commercially printing human tissues, replicating the function of native tissues, for research. AppliedVR is the first platform for healthcare, offering patients an escape from the stress of chronic pain and the recovery of surgical procedures. Partnering with Cedars-Sini Medical Center, the company's products, Pain RelieVR, were developed with psychologists and medical academics, releasing various suites. The first such product, Guided Relaxation, transports a patient from the medical environment and to a peaceful scene, teaching them to relax and learn mindfulness. The use of virtual reality games could, in turn, reduce the use of opioids for combatting certain types of pain. According to reports produced by P&S Market Research, the global personal robot market will reach $34.1 billion in 2022. Pillo Health and Orbita have merged to create an in-home healthcare robot, combining AI and voice technology. They are hoping to release the robot in Q4 of 2018, to ‘reduce many of the inefficiencies in healthcare today’. While the healthcare robot is not designed to replace human interaction with medical professions, it can remind those who require medical services to take their tablets at certain times, for example. Digital stethoscopes have proved an enormous invention for GPs around the country, offering features such as audio recording and the amplification of sound to improve the accuracy of diagnosis. Today, stethoscopes may seem outdated, but they have not lost their power, with patients expecting to see medical professions utilising the tool. In fact, many companies are still investing in the apparatus. One such company is Eko Devices, producing the DUO. This piece of medical equipment is a combined electronic stethoscope and EKG, allowing recently unprecedented insights into cardiac function. The DUO works in conjunction with the mobile application, enabling clinicians to review the rhythm of heart sounds and offer groundbreaking remote care. Ultimately, technology is changing the face of the medical industry, allowing for better care and diagnosis. The future is here.